When surrounded by darkness your entire life, would you eventually succumb to it? After a lifetime of abuse, betrayal, and loss, artist Chase Romano wanted the misery to end. But as the ghosts of the past strangled his future, the battle for his mind, his heart, and his life seemed hopeless. In a last-ditch effort to right his wrongs, Chase seized a glimmer of light from Mr. Leonard Bazzi, a New York City mob enforcer who noticed a dread within Chase that could be harnessed for their mutual benefit. Bazzi, or Mr. Baz, as he preferred to be called, promised Chase the world. What he got was so much worse. What he got was hell. Can the fragments of a shattered life ever truly mend themselves? The Accursed shoves readers into a thought-provoking, dark narrative about choices, temptation, and the ultimate price for failure. Fans of Jacob’s Ladder, Memento, and Before I Go to Sleep will rip through this fast-paced, dark psychological thriller. 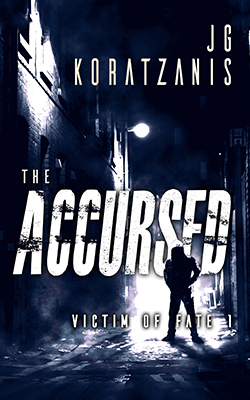 The Accursed is a ruthless and confrontational story that will leave your mind whirling long after finishing the last page. Pick up your copy today and be sure to check out jgkor.com for more stories!